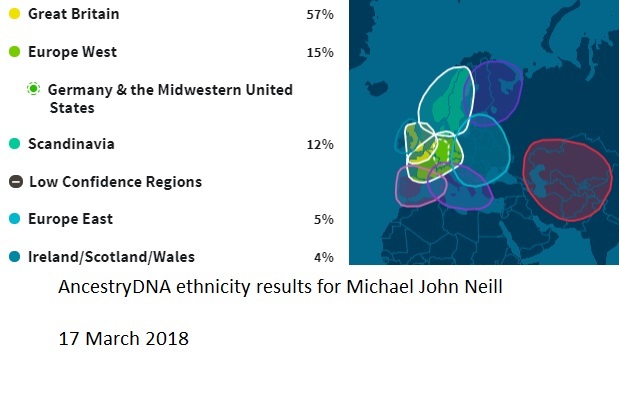 On paper, I’m 1/8th Irish. My great-grandfather, Charles Neill, was born in 1875 near West Point, Hancock County, Illinois, to parents who were natives of Ireland. My DNA ethnic test results tell a different story. We’ve mentioned before the difference between a paper pedigree and where your DNA says you originate. The DNA ethnicity goes back significantly further than the paper pedigree. My 1/8th Irish heritage stems from Samuel Neill and Annie Murphy, mid-19th century Irish immigrants to Canada and eventually the United States. Samuel was an Irish Protestant from the north. His ancestral roots may very well rest in Scotland. Annie’s specific Irish origins are not known. She may very well have been an Irish Protestant herself–again with roots eventually going back to Scotland. The ethnic results are based upon migration patterns over thousands of years. That’s a great deal more than the approximately 175 years I have my Irish heritage traced back. AncestryDNA puts me at 4% in the “Ireland/Scotland/Wales” category. FamilyTreeDNA and MyHeritage put me at 0%. Keep in mind these percentages are approximations. Personally I look at all of these as broad generalities. They all say my heritage is European. That’s consistent with what I know. The rest of the numbers are based upon a variety of assumptions–about migrations, about people’s backgrounds, etc. I have no doubt I’m a descendant of Samuel and Annie. There are twelve of their descendants who all match each each other in AncestryDNA results–including me. And…we descend from four different children of Samuel and Annie. I’m not too worried about the “far back” ethnic results. For me…the results are entertainment more than anything else. I’m more concerned about trying to find Annie’s parents. We’ll write about that in a future post. I have no Scandinavian ancestors in my paper tree, but the tests show me with significant Scandinavian ancestry. We’ve briefly discussed the valid reasons behind those results before but will revisit them in a future post. But…I’ll focus more on my paper tree and using the DNA results to connect with people in the present–not on ancestral origins thousands of years in the past. The Scandinavia results in Ancestry DNA have been puzzling. 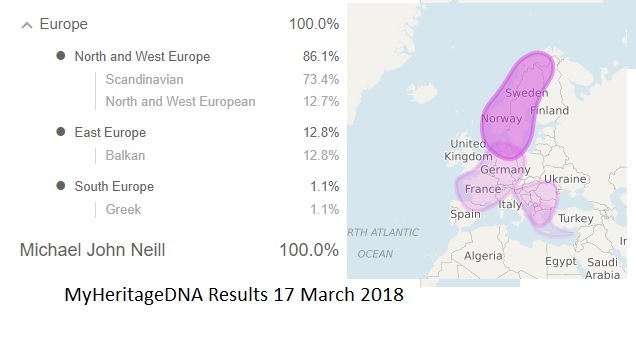 My results show 17% and 13% Europe East. I do have a relative from Denmark on my mother’s side. 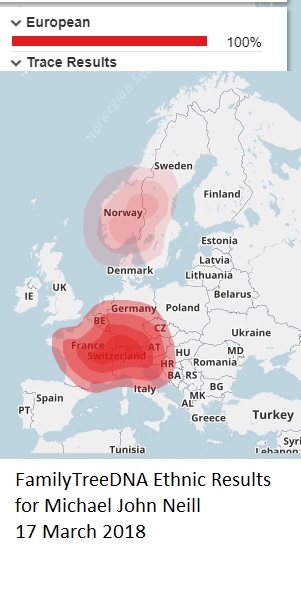 My father’s DNA test shows 30% Scandinavia and 25% Europe East. He should be mainly French and German. My results a somewhat comparable, i think a lot of your scandinavian DNA is “hidden” in your Ancestry Great Britain part. Danish/Anglo-Saxon. I’am from the coastal part of the Netherlands and have 72-75% scandinavian on MyHeritage and on Ancestry 49% Great Britain, 26% Germany, netherlands, Belgium&Luxembourg, Sweden&Norway 12%. Thanks. That’s very likely true. My Ostfriesen ancestry (1/2 on paper) is also complicating my part from Great Britain. Danish/Anglo-Saxon = more or less the same as Frisian.